From the BBC April 3, 2017. A new scheme in the City of London is aiming to recycle five million disposable coffee cups this year. 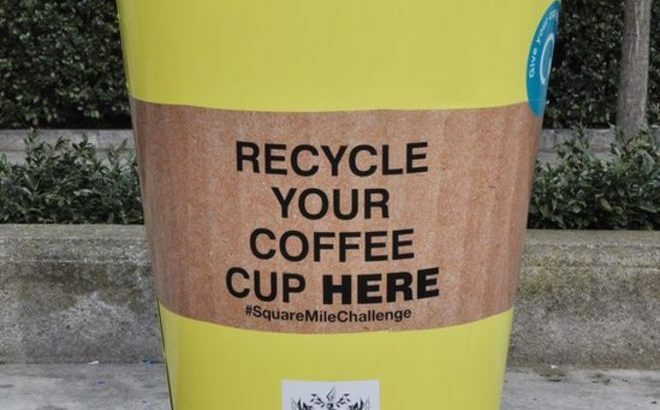 More than 100 retailers and 30 organisations are offering recycling facilities as part of the City of London’s Square Mile Challenge. The organisers claim the initiative will be the UK’s biggest coffee cup recycling scheme. Only 1% of the 2.5 billion paper coffee cups used in the UK each year are recycled. The plastic film inside the cups means they can rarely be recycled with other mixed recycling.